Tired of people fidgeting with your smartphone and content? Friends constantly spying on your texts or kids playing long hours on your smartphone. Well, your solution has arrived in the form of Perfect App Protector. This is one of those few apps that does exactly what it says. Developed by Morrison Smart Software, the same people who have developed other security solutions for the Android ecosystem, this is truly a genius in its genre. There is no gimmick with the Perfect App Protector and the name says it all. This app allows users to password protect every app they want to. So, whether its Gmail, games, messaging, gallery, camera, or something as simple as contacts, this app perfectly secures them with a password of your choice. The very direct and non-obtrusive approach method of the app is really astonishing. No gimmicks, no locked functionality, no beating-around-the-bush. This app really makes things neat and user-friendly. On installing the app, users are welcomed with a screen to enter the desired password (can be changed later), then just choose the app to be locked; irrespective of the memory location (phone or SD card), return to the homescreen, and then Voila! the app is locked with the desired password. 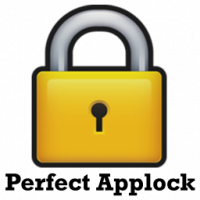 Users will then need to enter the passcode every-time they wish to access the locked app. Alternatively, users also have the option to use the pattern-lock functionality for better protection. There are other added features, such as, Always Lock, Automatic Login, Register Pattern, Active Lock, and various other customizing option for the desired locking method. A great app for every user whose device is more of a public commodity rather than a private one. Like most free apps, this one too is heavily dependent on adverts and requires users to purchase or upgrade to the PRO version at a cost. Overall, this app is really great and gets the job done in a jiffy. The recent app update version 4.2.2, only supports Android 2.1 and above devices. P.S: The app is not supported on Android devices with smaller screens, such as, HTC Wildfire.